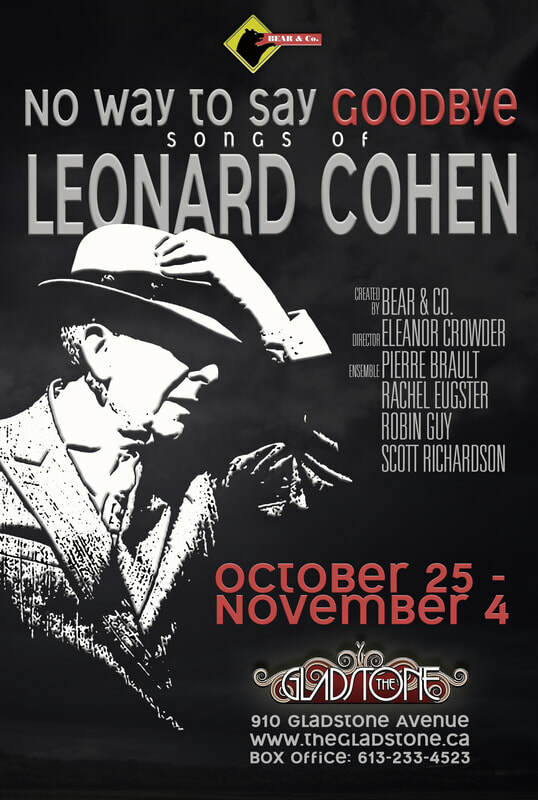 Leonard Cohen tribute - Bear & Co.
No Way to Say Goodbye: Songs of Leonard Cohen played at The Gladstone Oct/Nov 2017. No Way to Say Goodbye: Songs of Leonard Cohen showcases his work, in all its power and delicacy. The show was born in the Gladstone dressing room during Bear & Co.’s production of Jacques Brel Is Alive and Well and Living in Paris last year, as the cast began to imagine their own personal farewell to the legendary poet and songwriter. With a strong vocal ensemble backed by a variety of instruments, Bear & Co. brings songs from all phases of his career to life on the Gladstone stage, celebrating Cohen the man, the seeker after truth, the obsessive lover, the unrelenting artist. No Way to Say Goodbye digs deep into his incredibly varied songbook, ranging from his days as a folk balladeer and the early acoustic hits such as “Suzanne,” through his surprising transformation into a pop-rock performer in the 70s and 80s, and on to his late-life period of renewed creative energy, including last fall’s remarkable and bittersweet final album You Want It Darker. Leonard Cohen, towering Canadian icon, is in our blood. Join Bear & Co. to help pay tribute, and to voice our collective Goodbye. Bear & Co., you have a hit on your hands. You need to promote it, tour it, get it out there and nudge this show toward the runaway success it’s poised to become. Your arrangement and production will grab the interest of theatre companies across North America and Europe. Your work begs to be performed elsewhere. That’s how good it is. If this were stock, I’d be buying shares in Bear & Co., like now. No Way To Say Goodbye: Songs of Leonard Cohen has all the potential to become another Jacques Brel is Alive and Well and Living in Paris. Like that 1968 Broadway hit, which still gets produced around the world to this day, this similarly conceived production could become just as renowned. It is at least as powerful. It is every bit as evocative. It hits all the notes – arrangement, set, lighting. And it’s homegrown. But what makes No Way To Say Goodbye even mightier to Canadians is that, like Brel the Belgian troubadour was to Belgium and the French, Cohen is to Canada and the English and the French.Though Cohen was ours, Cohen was everyone’s. The homage that is No Way To Say Goodbye gives the man and his music back to the world. Where it belongs, where it can exalt. “Nobody writes lyrics like Cohen could,” muttered the man beside me, clearly entranced. This show is an adoring tribute to all that Cohen was – poet, songwriter, ladies’ man, cynic, lover – and Jewish. The 21-song playlist that Bear & Co. assembled, arranged, choreographed, played and sang includes all the familiar favourites: Everybody Knows; Famous Blue Raincoat; Suzanne; First We Take Manhattan; Dance Me (To the End of Love); So Long, Marianne. It also included a few arrangements that weren’t as familiar (even to an ardent fan like me). It gave the audience an appreciation of how much music his 60-year career produced. I was touched for the inclusion of You Want it Darker from his final album, but somehow more touched for the surprise inclusion of prayers sung in Hebrew. The stunning soprano voice of Rachel Eugster delivered those beautifully. Four players, four voices. The harmonies, there had to have been twenty of those, in combination. The cast made their talents look effortless, from strumming guitars and mandolin to playing piano, accordion, flute, harmonica and tambourine. There were exquisite solos (Pierre Brault in Lover Come Back; Scott Richardson in My Gypsy Wife). Some piercing duets (Robin Guy and Rachel Eugster in If It Be Your Will; Pierre Brault and Robin Guy in Ain’t No Cure For Love). But it was when the whole ensemble belted out Cohen’s anthemic wonders like Hallelujah and Anthem (Ring The Bells) that they brought the house down. Cohen has been dead a year, Hallelujah has been played to death and yet, it can still give almost anyone the chills. Director Eleanor Crowder knew instinctively that voices could not be contained on hearing the formidable Hallelujah or Anthem. So up went the lights and up soared the joy when the audience too, was given voice. It had to be something of an experience of spirituality; why else would my tone-deaf husband join in and sing?Such is the spirit of this company that visiting choirs are invited to attend and sing these refrains as a spontaneous pop-up choir. Leonard Cohen would’ve smiled his wee smile at this. You’ll regret it if you miss No Way To Say Goodbye. Especially after it gets big and famous and costs a fortune to see when it makes a stop here again. Hear director Eleanor Crowder and actor/singer Rachel Eugster on CKCU's Friday Special Blend with Amanda Jetté Knox, Susan Johnston, and Bob LeDrew. Hear Robin Guy, Scott Richardson, and Eleanor Crowder on CKCU's Canadian Spaces with Slo'Tom and Chris White. Cohen runs through my life. Spicebox of Earth poems became text for performance experiment. “Suzanne” and “Marianne” were favourites to busk to in France, as they were in Canada. Kitchen tables, street corners, cafes. Desert crowds, city crowds, I’ve sung away the leaving and been held by his music, letting the light in. Cohen does that, and performance does that. My work experiments with performance as transformative energy in a wide variety of applications. In the last few months, I directed a youth cast in Odyssey Theatre’s Branching Out, as part of their Spreading Roots outreach. I performed with Zoe Georgaras in Fire & Water as part of Artists on the Rocks at Remic Rapids. I co-created and performed Echo, a site-specific work for the Bonnechere Caves with Kyra Shaugnessy, Andy Trull, and Linnea Rowlatt. I directed Romeo & Juliet for Bear & Co.’s Shakespeare in the Park tour. I am directing two community processes: Overbrook, The Musical, for late November, and an Anne Of Green Gables for next April. The discovery is engaging and endlessly changing. Thank you to the many players in this theatre tidal pool. Next work here: Grounded with Alexis Scott, going up in January. This is Jane’s fourth production with Bear & Co. Recent projects include SM at GCTC’s You Are Happy; dispatching drivers for the Canada Scene Festival; and SM for Judith Thompson’s new play, Hothouse, and a production of The Mountaintop, both at Theatre Kingston. Highlights of her cross-Canada career include Women Who Shout at the Stars (Ottawa Fringe and Toronto’s SummerWorks); the Capital Critics award–winning shows And Slowly Beauty (NAC/Belfry) and A Christmas Carol (NAC); along with a Rideau Award for Stage Management on The Turn of the Screw; and working with the Shaw Festival, NAC, GCTC, and the Thousand Islands Playhouse. Jane has also stage managed school tours, puppets, operas, and theatre with the visually impaired. Next year she will SM Armstrong's War in Kingston and ASM Up To Low at the NAC. Pierre Brault is a multi award winning actor, playwright, and stand-up comedian. He is perhaps best known for his many solo plays performed at the NAC and GCTC, including Will Somers: Keeping Your Head!, Portrait of an Unidentified Man (both nominated for a total of 6 Rideau Awards 2017) 5 O’Clock Bells, and Blood on the Moon (Capital Critics Circle and Montreal English Critics’ Circle Awards: Best Actor), which ran for three consecutive summers at the NAC and toured Canada. His works have appeared on stages in New Zealand, Great Britain, and Ireland. Look for Pierre’s return to the Gladstone Theatre March 11-17 for A Night in November. My first acquaintance with Cohen’s songs, as far back almost as memory, was through the female artists who covered him. What delight now to go to the primary source, to study Cohen’s vocabulary, his rhythms, his way of making the most complex musical or poetic thought seem simple, obvious, inevitable. And what pleasure to explore this universe in such company. Robin, Scott, Eleanor, Jane—all treasured companions from last year’s production of Brel—into which mix Pierre slipped like something . . . simple, obvious, inevitable. Most recently at The Gladstone, I was Macbeth’s Banquo and Lady MacDuff (and music director) and Martha in Who’s Afraid of Virginia Woolf? (Bear), and three different men in Anton In Show Business (Three Sisters). A founding member of Bear & Co. and of Dragon’s Tea Trio, I am also the author of the play Whose Æmilia? (whose central character might have been Shakespeare’s Dark Lady of the Sonnets—or not) and of the award-winning picture book The Pocket Mommy (Tundra/Penguin Random House). Building this show has been a labour of love. It was music—in the form of childhood piano lessons—that ignited my passion for the stage, and this return to musician-hood after several years has been a delightful homecoming. I am thrilled to work again with Bear & Co., after last season’s Jacques Brel…, as well as having played Jacques in the As You Like It parks tour. I have also had the privilege to sing such roles as Maria in The Sound of Music, Diana in Anne…, Martha in The Secret Garden, and Bella in Rags. It was an honour to be nominated for Best Professional Actress by the Capital Critics Circle for my work as Eve and Lucifer in The Creation of the World with 9th Hour. My next projects include Voices From the Front (opening next! ), The Clean House (February 2018), and the new Canadian musical Miss Shakespeare (May 2018), all at The Gladstone, later this season. Scott rediscovered his love of theatre last season as Musical Director for Jacques Brel... with Bear & Co. He is now excited and rather astonished to find himself once again singing in a theatre. Prior to last year, his most recent stage appearance was as Cale in Fire (Live Bait Theatre) twenty-five years ago. These days, Scott is active as a freelance accompanist and choir director. He is the pianist for the Ottawa Choral Society and has also accompanied the Carleton University Choir, the Canadian Centennial Choir, and the Ottawa Children's Choir. Scott is the Music Director of both Musica Viva Singers and Atlantic Voices: The Newfoundland and Labrador Choir of Ottawa. Scott grew up in Dartmouth, Nova Scotia, and studied music at Mount Allison University. His graduate studies took him in a different direction, however, and he completed a Ph.D. in English literature at the University of Ottawa. As an organist and choir director, Scott has held various positions in the Atlantic Provinces and in Ottawa; he is currently Music Director at Orleans United Church. Recent projects include working with Christopher Plummer on his “Shakespeare and Music” concert here in Ottawa, on Bear and Co.'s MacBeth, Jacques Brel . . . , and Finishing the Suit, and for the St. Lawrence College productions of The Wizard of Oz and Twelfth Night. *Join us on October 29 at The Gladstone for a special event! 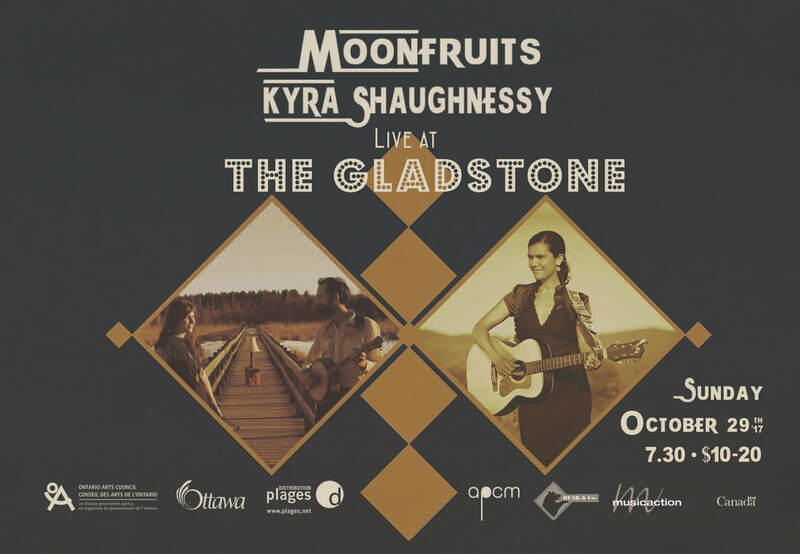 Moonfruits & Montreal's own Kyra Shaughnessy invite you to The Gladstone Theatre on Sunday, October 28th for a bilingual double-bill of songs and stories. Both artists will be perform with a full band to delight and transport the listener. Moonfruits et la folkeuse montréalaise Kyra Shaughnessy vous invite à The Gladstone Theatre le dimanche 29 octobre pour une soirée raconteuse, baladeuse, tisseuse d’histoires. Ce spectacle verra les deux artistes en formule élargie, dans l'espérance de vous faire voyager d'autant plus loin. [By turns cheeky, atmospheric and vulnerable, bilingual folk duo Moonfruits prides itself on crafting honest music that transports the listener. Stripped down arrangements bloom into soundscapes that dance around the couple’s soaring harmonies and storytelling. Expect imagery-first folk music that captivates listeners and celebrates common ground. Kyra Shaughnessy’s identity as an artist is nourished by an uncommon diversity of experience. The result? A folk-roots blend defined by warm, intimate vocals and the unmistakable depth and authenticity of her poet’s pen. Often compared to the likes of Joan Baez and Ani DiFranco, Kyra’s music artfully combines elements of “political folk” and sacred songs to captivate audiences of all ages and all walks of life. L’identité artistique de Kyra Shaughnessy se nourrit d’une diversité d’expériences et d’une sagesse inattendu chez quelqu’un de si jeune. Le résultat ? Une musique folk-roots épurée, teinté de jazz par sa voix feutrée, bondée d’une poésie simple qui captive les publiques de tous les âges.